I’m American, but I go to school in Germany, and I’ve noticed a few differences in writing supplies between the two countries. All through high school, I wrote my class notes in cheap spiral notebooks from Target, you know the type, with college-ruled paper. I didn’t bring any with me to Germany, because I figured, cheap notebooks must be available everywhere! And, sure, they are. But not college ruled. I found only two kinds of notebooks at Marktkauf, the German equivalent of a Wal-Mart or Target: lined notebooks with paper closer to what we call wide-ruled, and notebooks with squared paper. Nothing college-ruled in sight! I chose squared paper, because I have small handwriting, and I have to say, I now actually prefer to write on squared paper. The lines are more my size than even college-ruled paper. After some discussion with a German friend, we figured out a theory as to why college-ruled paper doesn’t exist in Germany: students are taught to write with fountain pens. I had never in my life used a fountain pen; in America, there are artsy, old-fashioned, or elite people who might use them, but we use cheap ballpoint pens, or pens with gel inks or whatever (or pencils, but I’ll get to that in a minute), not fountain pens. The vast majority of Americans (myself included at that point) would have no idea how to use a fountain pen, but for a German student, it’s normal. They all have correcting ink for when they make a mistake with fountain pens, too! To my German friend, it was unthinkable that one would turn in any sort of official assignment written with the kind of pen that comes in a package of twenty for less than three dollars at any discount store–or, God forbid, written in pencil! They even write math in ink, and when I did find some pencils at a stationary store in Germany (a chain called McPaper, for some reason), none had erasers. None. Okay, maybe one over on the end, but 99% did not have erasers. In America, fancy artist pencils may not have erasers, but those that the average person writes down grocery lists or scribbles calculations with certainly do! Again, I turned to my German friend, who said : “Why would those pencils have erasers? Pencils with erasers are for children.” Which, in my opinion, is a really interesting statement. It says that in the German mindset, they can’t admit to the fact that they might make mistakes and have to correct something. They do have erasers, separate from the pencils, but those are not so readily available: those do not have the reminder that one might make a mistake staring you in the face as you write. I guess. Apparently, admitting that we’re all human and make mistakes is not the German thing to do. I still don’t know why squared paper is a normal writing paper in Germany, though. I guess because schoolchildren use it a lot, definitely because it’s easier to do math on, and possibly the teaching of handwriting is made easier on squared paper, the same way we use paper with a dotted line between every two solid lines to teach handwriting in the States. It’s interesting–something I always thought was universal, stationary, turned out to be far from that! I’m a vegetarian, buy products not tested on animals, eat free-range organic eggs (I couldn’t be a vegan; I really like chocolate chip cookies! ), and don’t purchase leather products. I simply won’t support that industry (I will admit to caving once on a secondhand product that may or may not have been genuine leather; I still tell myself it wasn’t, but I really don’t have any idea), and won’t have some poor cow’s skin as my sofa cushion or, as is more pertinent here, notebook cover. It really frustrates me to find a notebook I like in the store, and then start reading the product details, only to find out there are animal products involved. It’s part of why I like Moleskines; the generic alternatives may be cheaper, but the Target version, for example (Markings notebooks, I think they’re called), has a bonded leather cover. It’s entirely possible to get very leather-like results without the animal death these days; that’s why I have to check the tags! So for me, leather notebooks are something that are entirely avoidable, and a positive not just for me, but for the companies, I think: a few people might put down a nice product because it isn’t genuine leather, but I’d say there are more who would put it into their shopping basket if no animal byproducts were involved, than would give up on something they liked just because it included a dead animal. Think on this, please, office supply industry! 1. Quotes. 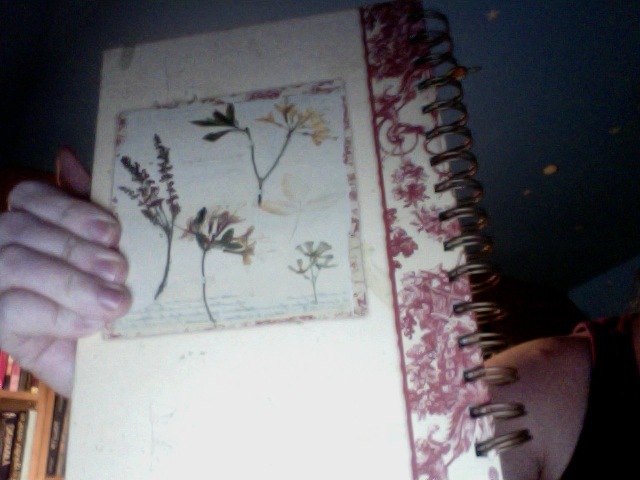 I don’t know if this really counts as currently in use, because all the pages have something on them, but I keep it out. Each page has one quote that is in some way meaningful to me or inspiring or something. I keep it out in case I need to find one, for whatever reason. It’s a Paperblanks book with a magnetic clasp called “Soul & Tears Mini” from Laurel Burch’s Spirit of Womankind collection. 2. Thoughts/quotes. This is the blank pocket Moleskine, and I use it to write down quotes, thoughts, poems–anything I want to remember, I guess, that fits on less than one of these pages. Brief ideas that I might come back to later, mine or someone else’s. Mostly someone else’s. Sometimes in my head I think of these as just “quotable” things. It’s new, since the old quotes notebook (see above) was filled, and I’m following a slightly different model here. I also write more than one item per page. 4. Focused journal. This is a 13x21cm Moleskine with squared paper. I guess I need to explain this concept a little, though. It’s a journal, yes, but I think of it more as a paper blog: I write only entries with a topic and a focus. The date and topic are written above the entry. it has to be at least one full page. I actually keep a list of possible topics on loose paper in the back pocket. Topics include letter writing, blank notebooks, why I love photography, specific events in my life, observations of specific places I’ve been, cultural differences between the two places I live (the US and Germany), etc. 5. Rambling journal. I’m way less concerned with what I put in here; it can be random stream-of-consciousness, and I don’t worry about it. This one isn’t so much keepsake as ranting and self-therapy. 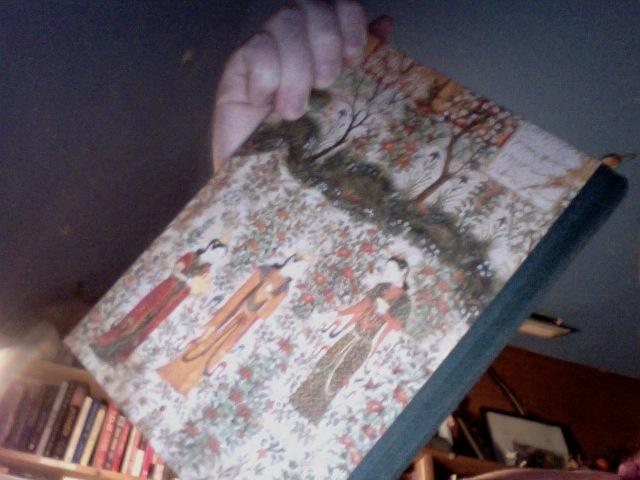 This is a bound journal with a picture on it that’s apparently a fifteenth-century piece called ‘Persian Garden.’ It’s lined inside, and published by Galison. I found a couple of listings for it, all listing it as unavailable at this time, as it was published in 2001, but no pictures, so, again, you’ll have to make do with my webcam picture! This, for me, takes the pressure off of journaling to just write significant things–separating the significant from the insignificant. What about you? How do you use your notebooks? Hello, world. I’m Jocelyn, and I’m here writing about writing. I don’t mean the intellectual process, but, rather, the physical process, involving notebooks and paper and pens and maybe computer programs. I intend to use this blog to write reviews of various products related to writing, mostly notebooks/paper right now, because I’ll just be working with what I have on hand, what I’ve already got and what I already use. Expect the first reviews soon. You can contact me by leaving a comment or emailing me at pearcejm@gmail.com.